Process management is a concept that integrates quality/performance excellence into the strategic management of organizations. It is Category 6.0 of the Malcolm Baldrige National Quality Award. Process management includes (1) process design or engineering, which is the invention of new processes; (2) process definition, which requires the description of existing processes; (3) process documentation; (4) process analysis and control; and (5) process improvement. Process design and definition include describing what must be done and how it is to be accomplished. After defining a process, it must be documented using a flowchart, a process map, or even a simple checklist. Until the process is described and documented, one cannot be assured that a process is in place. At that point, the process can be analyzed and improved. There are many process analysis tools, including cause-and-effect diagrams, statistical process control, and trend analyses. Process improvement may result from gradual, continuous improvement or a dramatic reinvention or reengineering of the process. Process management can trace its roots back to the early days of industrial engineering and quality management (quality control and quality engineering). The earliest focus was on streamlining factory processes to increase productivity. However, process management concepts are now used in all types of organizations to improve process baselines (safety, quality, cycle time, productivity, on-time delivery, etc. ), as well as to improve financial and operational results. In 1911, Frederick Taylor published The Principles of Scientific Management. Some of his ideas are the predecessors for modern industrial engineering tools and concepts that are used to reduce cycle time and/or improve productivity. Frank and Lillian Gilbreth also used time and motion studies to improve processes and to increase productivity by evaluating how much time it took to do each task within a process, and the best way to do each task (the motions involved). Their work and personal lives were publicized in the book, Cheaper by the Dozen. One of the world's leading experts on improving the manufacturing process, Shigeo Shingo, created with Taiichi Ohno, many of the features of just-in-time (JIT) manufacturing methods, systems, and processes that constitute the Toyota Production System. Much of Shingo's work is documented in books he has written, such as A Study of the Toyota Production System From An Industrial Engineering Viewpoint (1989). Dr. W. Edwards Deming (1900–1993) is famous for his work in Japan in the 1950s and for theories such as his Fourteen Points and Plan-Do-Check-Act (PDCA) Cycle (also referred to as the Shewhart Cycle). He also refined and publicized other concepts and tools, including statistical process control. Many of Dr. Deming's theories are contained in his book, Out of the Crisis. Dr. Joseph Juran (b.1904) also worked with the Japanese beginning in the 1950s. Some of his theories supporting process management are Juran's Trilogy (process planning, process control, and process improvement); Big Q (the quality department is responsible for quality) vs. Little Q (everyone is responsible for quality); and the Quality Planning Roadmap. Juran's books include Juran's Quality Control Handbook and A History of Managing for Quality. Dr. Kaoru Ishikawa, author of Guide to Quality Control, invented the cause-and-effect diagram and taught people involved in teams (quality circles) to ask what caused each effect. Dr. Walter Shewhart, a statistician who worked at Western Electric, Bell Laboratories and who used statistics to explain process variability, first published his theories in his book Economic Control of Quality of Manufactured Product (1931). Who are the internal and external customers of a process? Who improves processes-process owners, customers, suppliers? How do you improve processes? What might not add value for customers? What role does measurement play? A process is a series of connected steps or actions with a beginning and an end that can be replicated. Organizations should be viewed as a set or hierarchy of processes that produce outputs of value to a customer, as well as a set of functions such as engineering, manufacturing, accounting, and marketing. The most successful organizations are managed from a horizontal (process) perspective, as well as from a vertical (function) perspective. 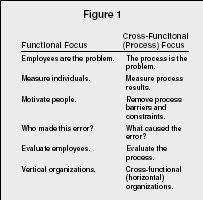 Understanding an organization from the process perspective will cause changes in the way one thinks about people and processes as depicted in Figure 1. Examples of processes in various organizations are included in the following list. Please note that many of the processes could be found in all the various organization types. A process involves the steps or stages by which inputs such as people, materials, methods, machines, and environment are transformed into outputs (products and services). Because a transformation process exists to satisfy customer requirements, process owners need to understand who their customers are, what they want, and how to provide what they want. The customers of a process are the people who require the products and services that are the result of the process or one phase of the process. They are classified as: (1) external customers-people who ultimately use the products and/or services (process outputs or work results) of an organization; and (2) internal customers—the owners of the next phases in the process who must wait for the delivery of a product or service before completing work. External and internal customers must be satisfied if organizations are to experience the highest levels of success. Individuals and teams must understand their roles as suppliers to internal and external customers if customer satisfaction is to be a reality. At the same time, individuals and teams must act as internal customers who communicate requirements to internal suppliers. Customers (internal and external) have a right to expect quality products and services. Every member of an organization has an internal customer—the next phase in the process. If each team member treats other team members like valuable customers, relationships and work results (individual and team performance) will improve. The customer determines if the product or service is what he or she ordered and if it has the value expected and promised by the supplier. Individuals and team members should ask internal customers and suppliers, "How am I doing?" and "What did you expect compared to what I gave you?" The answer will assist in improving processes, products, services, and relationships. Basically, customers want to be their suppliers' first priority. They want (and deserve) perfect products and services delivered on or ahead of schedule at the lowest possible cost. They expect suppliers to be in the improvement mode of operation so that the customers are assured of paying a competitive price. Perfection is the aspiration, level-improvement is the goal. Whatever today's standard is, tomorrow's customers will require more. It is the responsibility of the supplier to remain on a journey toward perfection; to determine current baselines for important customer requirements such as safety, quality, schedule, and cost; and to determine what process and relationship improvements are necessary to improve those baselines. RELATIONSHIPS AMONG QUALITY, SCHEDULE, AND COST. One of the things that must be done when evaluating and improving processes is to establish process baselines. The baselines for quality, schedule, and cost are so interwoven that it is difficult to measure and improve one of them without considering the other. This is as it should be since customers want the highest quality products and services on or ahead of schedule and at the lowest possible price. If you improve the quality of processes and relationships, you can expect other baselines (e.g., quality, schedule, and cost) to improve. While quality, schedule, and cost are measured as separate baselines, long-term improvement is interdependent and process focused. Be competitive based on speed as well as quality. Provide real-time information to internal and external customers. Design and streamline processes so that they are free of defects, constraints, and activities that do not add value for the customer. Change paradigms based on sequential decision making to paradigms that include concurrent decision making, as well as concurrent engineering. Empower workers to dismantle time-wasting bureaucracy. The process owners (the people who actually do the jobs) are the most knowledgeable about the processes by which they accomplish their work. Therefore, if process evaluation and improvement becomes an integral part of daily work, safety improvement, defect prevention, and cycle-time reduction can become a reality. Process owners are those empowered to do work, improve how they do the work, and accept accountability as process owners. They may continue making a product (e.g., buggy whips) long after the market is gone. These perfect products may have no customers. They may do everything in a process perfectly, but they may be doing many things that do not need to be done at all (efficient, not effective). They may be focusing only on quality, when speed is also important. They may miss opportunities to improve products, services, processes, and relationships. People who know the most about processes and who are most capable of evaluating and improving them are process owners—people who are accountable for process output or results. However, feedback from customers and suppliers contributes a great deal to improvement. Examples of data a customer could provide include (1) whether the product or service meets the customer's needs/expectations; (2) whether there are any defects or discrepancies; and (3) whether the product or service is delivered on-time or early. customers met lead-time requirements when placing orders. Improvement may be gradual and continuous (i.e., kaizen, continuous process improvement), or it may be dramatic process redesign (i.e., process reengineering). The differences between the two are depicted in Figure 2. Both gradual, continuous improvement and process reengineering should be an integral part of process management and improvement. 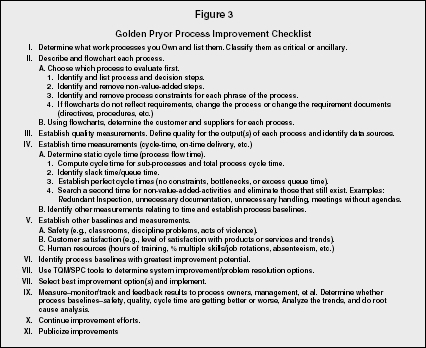 Use a structured methodology such as the Golden-Pryor Improvement Checklist. Eliminate activities that do not add value for the customer. Ask yourself: "Would the customer want to pay for this activity?" If the answer is no, ask yourself: "Why are we doing this? Is it a federal law? A state law?" If the answer is no, ask yourself: "What benefit do we gain by doing this?" At this point, you are coming close to eliminating the activity. Eliminate constraints—things that frustrate employees and slow processes. Streamline/simplify processes. It is difficult to document and teach people complex processes. Once processes are streamlined, computerize them if feasible. Provide leadership in a positive direction. Function as a strategist. Envision and invent the future with streamlined processes and relationships. Act empowered; be accountable. As individuals and members of teams, function as process owners and consider process management and improvement an integral part of daily work. Don't say, "They won't let us …" Make decisions, not excuses. Document and publicize improvements. Success breeds success. Continue to monitor and evaluate processes to identify additional opportunities for improvement. Ask (and teach others to ask) what, where, why, who, when, and how questions about each step in a process (or job). constraints keep us from doing it? knows how to do it? should know how to do it? When process-improvement efforts fail, it is generally because people have a deficiency in knowledge—they do not know what actions to take. They should be trained on specific improvement methodologies, and they should be held accountable for documenting improvement results. Improvement team members generally need a model that provides them common knowledge about what they are required to do individually and as a team, such as the Golden Pryor Improvement Checklist in Figure 3. WHAT MIGHT NOT ADD VALUE? The concept of value implies worth; value is something that a customer would expect to pay for, such as labor to design, build, and deliver a product or service. Customers want to pay for perfect products and services delivered on or ahead of schedule at the lowest reasonable cost. They only want to pay for activities that add value to products and services, and to processes and relationships that impact the products and services. Organizational leaders are accustomed to measuring things that are important to themselves. They also need to measure items that are important to customers. Improving process results does not require sophisticated measurements. It requires systematic identification and elimination of root causes of problems, process constraints, and activities that do not add value. It is as much continuous learning as it is continuous improvement. Improvement results from learning that is fed back and used as the basis for the next decisions. Quality—first pass yield, scrap, rework, repair. Productivity/Use of Time—cycle time, on-time delivery, non-value-added activities, overtime. Environmental and Safety—injuries, compliance, ergonomics, discipline problems, incidents of violence. People Issues—absenteeism, turnover, morale, grievances, skill levels, stakeholder satisfaction. Customer Satisfaction—new and repeat business, customer returns, warranty costs, field service reports/data, involvement. Supplier Performance—rating system, quality, capabilities, conformance to requirements. This essay focused on process management as it relates to existing processes, not the invention of new processes, products, and services. Process management requires process design (new processes) or definition (existing processes); process documentation; process analysis and control; and process improvement. Essential elements in process management include: (1) Understanding process thinking, including process ownership; (2) Identifying and satisfying customers' requirements; (3) Establishing process baselines and measurement; (4) Analyzing and improving processes through the use of quality and industrial engineering concepts and tools; and (5) Understanding how to use gradual, continuous process improvement and rapid, dramatic process redesign or reengineering. Process management is the job of every employee of every organization in every industry. Burlton, Roger. Business Process Management: Profiting From Process. Indianapolis, IN: Sams Publishing, May 2001. Crosby, Philip. Quality without Tears. New York: McGraw-Hill, 1984. Deming, W. Edwards. The New Economics. Cambridge, MA: MIT Center for Advanced Engineering Study, 1993. ——. Out of the Crisis. Cambridge, MA: MIT Center for Advanced Engineering Study, 1986. Garvin, David A. Managing Quality: The Strategic and Competitive Edge. New York, NY: Free Press, 1988. Hammer, Michael, and James Champy. Reengineering the Corporation: A Manifesto for Business Revolution. New York, NY: HarperCollins Publishers, 1993. Harrington, H.J. Business Process Improvement: The Break-through Strategy for Total Quality, Productivity, and Competitiveness. New York, NY: McGraw-Hill, 1991. ——. The Improvement Process: How America's Leading Companies Improve Quality. New York, NY: McGraw-Hill, 1987. Imai, Masaaki. Kaizen: The Key to Japan's Competitive Success. New York, NY: McGraw-Hill, 1986. Ishikawa, Kaoru. Guide to Quality Control. Tokyo, Japan: Asian Productivity Organization, 1982. ——. What Is Total Quality Control? Englewood Cliffs, NJ: Prentice-Hall, 1985. Juran, Joseph M. A History of Managing for Quality. Milwaukee, WI: ASQ Quality Press, 1995. Juran, Joseph M., and Frank M. Gryna. Juran's Quality Control Handbook. New York, NY: McGraw-Hill, 1988. ——. Quality Planning and Analysis: From Product Development Through Use. New York, NY: McGraw-Hill, 1993. Mizuno, Shigeru. Management for Quality Improvement: The 7 New QC Tools. Cambridge, MA: Productivity Press, 1979. Pryor, Mildred Golden, and Brian D. Cullen. "Learn to Use TQM As Part of Everyday Work." Industrial Management, May-June 1993, 10–14. Pryor, Mildred Golden, and J. Chris White. Strategic Quality Management. Dallas, TX: ASQ, Texas Quality EXPO, October 1996. Pryor, Mildred Golden, and Leslie A. Toombs. Total Quality Management. Commerce, TX: Center for Excellence, 1993. Pryor, Mildred Golden, and W. Donald Pryor. Process Reengineering. Commerce, TX: Center for Excellence, 1994. Senge, Peter M. The Fifth Discipline: The Art & Practice of The Learning Organization. New York, NY: Doubleday/Currency, 1990. Shingo, Shigeo. Revolution in Manufacturing: The SMED (Single Minute Exchange of Die) System. Cambridge, MA: Productivity Press, Inc., 1985. ——. A Study of the Toyota Production System. Cambridge, MA: Productivity Press, Inc., 1989. Smith, Howard, and Peter Fingar. Business Process Management (BPM): The Third Wave. Tampa, FL: Meghan-Kiffer Press, 2003. This was a good article! It covered a lot of the areas of Process Management. Before reading this article, I was not familiar with the term Kaizen. Now that I am familiar with the term, it will tremendously help me in my graduate career!